As usual, Mr. Joo Seong-Ha never disappoints, as he gathered information about how ordinary North Koreans are feeling about the newly anointed successor. Below is the translation. On September 28 when the Meeting of the Representatives of North Korean Labor Party, the face of Kim Jong-Un, shown for the first time to the world, was wooden. But by October 10, Kim Jong-Un appeared more relaxed at the platform of the Supreme Leader for the 65th anniversary of the establishment of North Korean Labor Party. He had a dignified air in front of the cameras of foreign media, and would whisper happily with Kim Yeong-Choon, Chairman of the Committee People's Force who was standing beside him. But this time, Kim Jong-Il was the one with the wooden countenance. 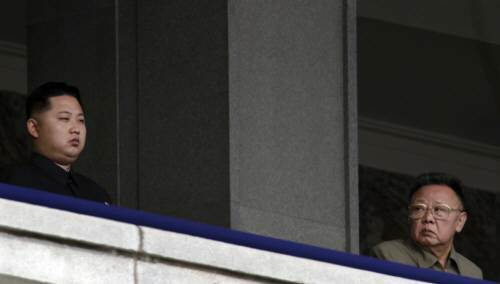 The next day, South Korean media all carried the picture in which Kim Jong-Il turned his face to look at Kim Jong-Un on the stage. The face of Kim Jong-Il, who put forth his son on the stage upon which the entire world watched, was filled with worry -- about if he could do well. Kim Jong-Il is not the only person who is questioning if Kim Jong-Un would do well. The whole world, including South Korea, is gazing upon Kim Jong-Un. North Korean people are not an exception. They are also gazing upon Kim Jong-Un, who all of a sudden appeared as a new leader, with mixed emotions. After Kim Jong-Un's coming out event, I spoke on the phone several times with my informants in North Korea in order to survey North Korea's popular opinion. Of course, the people along the North Korea-China border who can speak on the phone with South Korea should be considered the "awake" ones of North Korea, perceiving the world events to a certain degree. These people have not a shred of expectation in Kim Jong-Un's succession. The reaction of these people, who have strong aversion to Kim Jong-Il, was obvious. But wouldn't there be some people, who do not speak on the phone with the outside, who support Kim Jong-Un? To this, Mr. A, a North Korean living by the border, said: "Our whole village was speechless at some twenty-something became the successor, but no one is speaking out publicly," and added, "People are busy with surviving so it's just a hassle, and especially nowadays with the National Security Bureau heightening its watch after the end of the Party Representatives Meeting, a misspeech could lead to the annihilation of the entire family." In fact, it has been reported that North Korea's Security Bureau has been carefully surveying the public opinion, strongly suppressing criticism. Right now, there is no better tool for propaganda in North Korea than public lecture. Rodong Shinmun, the official paper of the Labor Party, only publishes approximately 200,000 copies, and are available to a few party officers in the rural area. There are other newspapers such as "Democratic Joseon" issued by the cabinet, "Youth Leaders" by Kim Il-Sung Socialist Youth Alliance and provincial papers by the labor party of each province, but they are likewise very limited in circulation. Thus, propaganda through newspaper is less than optimal. There is only one channel, Joseon Central Broadcasting, that broadcasts over the entire North Korea, and it only airs from 5 p.m. to 11 p.m. on weekdays. But during autumn, regular homes do not have electricity at night because electricity is concentrated for husking. So propaganda through television is without much effect either. But because public lectures are summoned by taking attendance, the participation is high and the participants tend to concentrate. Through such lectures, North Korea is propagandizing, "The anti-party, anti-revolution elements and spies receiving orders from South Korea's Security Planning Bureau is spreading lies and rumors criticizing the heads of the revolution among us." This is essentially a threat that if anyone says anything about Kim Jong-Un, he will be sternly punished as an anti-revolution element who received orders from a spy. There is a carrot along with a stick. There are propaganda that reporting a rumor-monger will have his anonymity protected and be financially rewarded. There are mentions of specific cases of receiving rewards. Regular North Koreans know from experience that getting caught at times like this leads to execution or a trip to the political prisoner camp not only for themselves but also for family and relatives as examples. So nowadays, everyone is watching his mouth. In fact, as the succession is progressing, the human rights conditions of North Korea is rapidly deteriorating. North Korea society is more terrorized than ever, with frequent public execution by firing squad to intimidate the people. Mr. B, a Chinese-Korean who trades with North Korea, said, "I often phone with trade partners, but when the succession topic comes up they all avoid answering, saying 'Let's not talk about that," and added, "I get the impression that they are only smiling bitterly, unable to express their unhappiness." But despite all this, North Korean people are not stopping with their ridicule of the succession. Mr. C, North Korean defector who lives in South Korea, after his recent phone conversation with his family in North Korea, said: "My house in North Korea gets a lot of visitors who are border patrols, and recently they have been complaining, 'Someone gets lucky with his parents and live the high life, and I get unlucky with my parents so I barely fill my stomach in my youth." "Someone" here refers to Kim Jong-Un. North Korean people's muted, inner ridicule is reaching its extreme in the process of deification to set up Kim Jong-Un as a great leader. The recent deification attempts are so ridiculous that one wonders if the propaganda officers composed it that way to indirectly laugh at Kim Jong-Un. The representative ones are claims like Kim Jong-Un wrote complicated Chinese calligraphy with a brush at age 3 or was an expert marksman with a pistol at age 3. It probably would not be a happy thing for North Korea's propaganda officials to serve as a decoration for the succession either. In North Korea, no matter how absurd the story a person concocts in order to describe Kim Jong-Un as a genius, he would be praised for his loyalty and never punished. So propaganda officials feel free to present a believe-it-or-not series of lies. And of course, North Korean people do not believe them either. North Korean people may have a difficult time imagining the world without the succession in their closed society, but at least they know that a three-generation succession is bad. It is not simply true for regular North Korean people, but true for Labor Party officials as well. In fact, the discontent of the officers would be greater than that of the people, because the officers are the elites of North Korean society who receive much more information from abroad. When Kim Jong-Un was waving toward the soldiers at the march, there would have been no officer who thought to give his life for a 27-year-old young punk who all of a sudden appeared with the title of general. The foreign media in Pyongyang to report on the festivities for the founding of the Labor Party had to hear the parrot-like responses from Pyongyang citizens whenever given a microphone. But this is not the true popular sentiment at Pyongyang. Whenever there is a big event in Pyongyang that involves many visiting foreigners, the regime makes the citizens study the expected questions and standard answers, and conduct an exam on them. This is why uniform answers are given. Even the people who criticize the three-generation succession at home have no choice but to reply to foreign journalists, "Our people's future is bright thanks to our Young Comrade [Kim Jong-Un]." But no matter how strong North Korean people's discontent, the likelihood of it leading to riots is small. In North Korean system of mutual surveillance and mistrust, collective action is exceedingly difficult. That getting caught for anti-regime activity leads to destruction of not only self but also the entire extended family also discourages action. 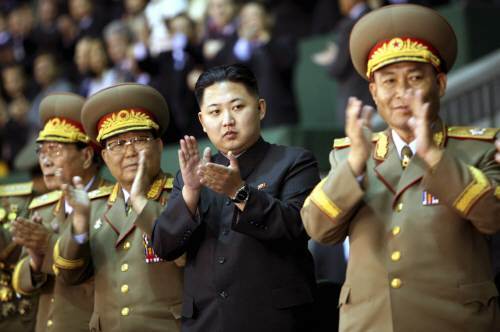 Therefore, North Korean people's discontent over Kim Jong-Un is followed directly by resignation. What is notable is that such resignation often develops into a "maybe" kind of hope. What North Korean people desire the most right now is change. In the 15 years since mid-1990s when the economy collapsed and massive number starved to death, North Korean situation did not change much. This situation can easily lead to a mindset that anyone -- even Kim Jong-Un -- can be supported as long as there is change. In other words, while the three-generation succession is not received well, there is some hope that maybe there is a big change if the leader changes, instead of Kim Jong-Il continuing on. Kim Jong-Un's looks, groomed to be very similar to Kim Il-Sung, can be seen as aiming toward such hope. From North Korean perspective, such look could work. But of course, the "working" face does not mean Kim Jong-Un would be successful in succession. From Kim Jong-Un's perspective, popular opinion is not the greatest threat. North Korea's surveillance system is going strong amid severe economic difficulties. Even if someone manages to cause a mass uprising, Kim Jong-Un can simply dispatch the nearby military to shoot them all on the spot. The greatest threat to Kim Jong-Un is Kim Jong-Il's death. Currently, to assist Kim Jong-Un, Kim Jong-Il created a patronage group consisting of his sister Kim Gyeong-Hee and his brother-in-law Jang Seong-Taek. But even if Jang is currently wielding great power as North Korea's number 2, there is no guarantee that his power will continue after Kim Jong-Il dies. Jang's power comes from the fact that he is married to Kim Gyeong-Hee. Kim Gyeong-Hee is power comes from the fact that she is Kim Jong-Il's sister. After Kim Jong-Il dies, the power of Kim Gyeong-Hee and Jang Seong-Taek cannot help but decline rapidly. This in turn leads to Kim Jong-Un's weakening. In such case, other people who are ambitious for power or willing to give up their lives for justice may emerge. Of course, the longer Kim Jong-Il lives, the more solid Kim Jong-Un power will become. 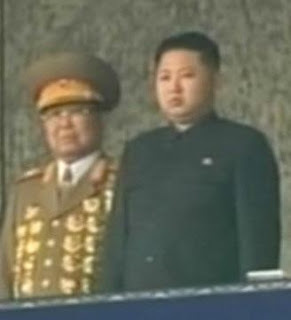 But Kim Jong-Il on October 10 at the march appeared very sickly. The reason why he is quickly handing over the power to Kim Jong-Un is also likely because of the worry that he may die any time now. From the outside Kim Jong-Il may appear to be straining himself, but from his perspective Kim Jong-Il is doing the best he can. "Can he really do well?" Intelligence reports indicate that KJI is on hemodialysis 2x/week. It's morbid to speculate about someone's death timeline, but given what's at stake here, it's hard not to do so. According to the most recent clinical data on hemodialsyis, expected survival in his age group is 4.5 years. I think he's already been on hemodialysis for at least 1 year.